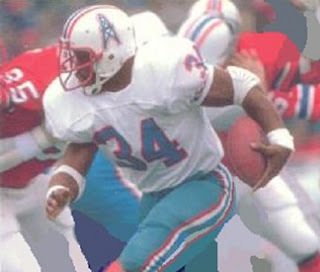 Two AFC contenders, the Houston Oilers and New England Patriots, faced each other in Foxboro, MA on November 12, 1978. The Oilers, coached by O.A. “Bum” Phillips for the fourth year, had a 6-4 record, with most of those wins coming in closely-fought contests. 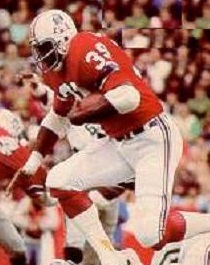 The offense benefited from the addition of star rookie RB Earl Campbell (pictured above), who was in contention for the league rushing title and drawing comparisons to Hall of Fame FB Jim Brown with his combination of power and speed. QB Dan Pastorini was playing with greater maturity at age 29 and behind a capable line. The defense was especially tough up front where NT Curley Culp was flanked by DEs Elvin Bethea and Jim Young, and the linebacker corps headed by Robert Brazile was outstanding. New England was guided by sixth-year Head Coach Chuck Fairbanks and was on a roll at 8-2, having won seven consecutive contests. The team was highly talented on both sides of the ball, with QB Steve Grogan directing an offense that featured a fine group of running backs led by FB Sam “Bam” Cunningham and receivers that included game-breaking WR Stanley Morgan and TE Russ Francis, one of the NFL’s best at the position. The defense was strong from front the back, although injuries were becoming a factor. There were 60,356 fans in attendance at Schaeffer Stadium on a windy and cloudy day. CB Raymond Clayborn returned the opening kickoff 36 yards and the Patriots advanced 33 yards in seven plays. 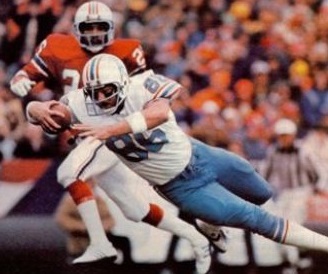 Steve Grogan threw to Russ Francis for 13 yards and Sam Cunningham (pictured at right) ran for 14 along the way. David Posey kicked a 32-yard field goal for the early 3-0 advantage. The Oilers drove into New England territory on their first series, keeping the ball on the ground with Earl Campbell and FB Tim Wilson handling the ball carrying. The drive stalled at the 44 and Houston was forced to punt. New England came back with a 62-yard advance in seven plays, the big ones Grogan passes to Cunningham for 13 and 27 yards. Posey made it 6-0 with a 34-yard field goal. The Patriots quickly regained possession when Campbell fumbled following a six-yard run and LB Rod Shoate recovered at the Houston 35. Grogan went to the air on first down and his pass was complete to Stanley Morgan for a gain of 32 yards as the first quarter came to an end. HB Horace Ivory started the second quarter with a three-yard touchdown run and, following Posey’s extra point, the home team was now in front by 13-0. It got worse for the Oilers on the ensuing kickoff when WR Johnnie Dirden fumbled after returning it 20 yards and LB Ray Costict recovered at the Houston 28. The Patriots were only able to advance nine yards in six plays, but added another three points when Posey booted his third field goal, this time from 37 yards. The Oilers moved well on their next series as Dan Pastorini completed passes to FB Rob Carpenter for nine yards and TE Mike Barber for 16. But they continued to be afflicted by turnovers as Wilson fumbled and the Patriots recovered at their 41. Cunningham ran effectively, with two 12-yard carries along the way, and Grogan scored a touchdown on a three-yard bootleg to complete the 59-yard drive in nine plays. Posey added the point after and, with 11:36 to go in the first half, the home team had an imposing 23-0 lead. Now in a deep hole, Houston had a three-and-out series but got a break when Morgan fumbled Cliff Parsley’s punt and LB Ted Thompson recovered for the Oilers at the New England 32. 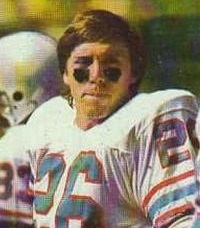 Pastorini immediately threw to WR Ken Burrough for a 20-yard gain and, two plays later, Carpenter (pictured below) ran eight yards for a TD. Toni Fritsch added the PAT and the visitors were finally on the board, although down by 23-7. That remained the score at halftime as Posey’s 38-yard field goal attempt on the last play of the half was unsuccessful. The start to the third quarter was unpromising for the Oilers when a Pastorini pass was intercepted by LB Steve Nelson and he returned it 17 yards to the Houston 37. Runs by Ivory and Cunningham got the ball inside the 10, but the drive stalled at the seven and Posey’s 25-yard field goal attempt hit the left upright and was no good. Given a reprieve, Houston advanced 80 yards in 17 plays, helped along when a punt was wiped out by an illegal chuck on the Patriots to keep the series going. Pastorini completed five passes, the longest to Barber for 18 yards, and Campbell, who caught a swing pass for 14 yards, pounded away on seven carries for 24 yards. Carpenter dove into the end zone from a yard out and, with Fritsch adding the point after, the New England lead was narrowed to 23-14. With time running out in the period, Grogan passed on the first play following the kickoff and it was picked off by CB Willie Alexander. As the game headed into the fourth quarter, the Oilers moved methodically down the field, covering 72 yards in 15 plays. Following two runs by Carpenter, Pastorini was sacked by Shoate for a six-yard loss but, facing second-and-16, he completed passes to Barber for six yards and WR Mike Renfro for 14 to keep the series going. Lining up for a 48-yard field goal attempt, Houston instead faked with Pastorini tossing a shovel pass to Carpenter for an 18-yard gain and first down at the New England 13. Five plays later, Campbell blasted into the end zone from a yard out. A bad snap forced the extra point attempt to be aborted, but Houston was now down by just three points at 23-20. Clayborn’s 30-yard kickoff return had 15 yards tacked on for unnecessary roughness on Dirden of the Oilers, giving the Patriots good starting field position at the Houston 49. Three running plays netted eight yards and a Grogan pass on fourth down was broken up by FS Mike Reinfeldt. The Oilers proceeded to drive 59 yards in ten plays. Pastorini converted a third-and-10 situation with a pass to Barber for 14 yards and followed up with a throw to Burrough that gained 26. Pastorini finished the series off by floating a pass to WR Rich Caster, who had gotten free in the corner of the end zone, and that resulted in a 10-yard touchdown. While they again had to abort the try for extra point, the visitors, who were once behind by 23-0, were ahead by three points. There was 2:29 left on the clock as the Patriots came back on offense but, facing fourth-and-five, they again failed to convert when Grogan, facing a heavy rush, threw an incomplete pass. The Oilers ran the clock down, punted, and Grogan’s last-ditch pass with seven seconds remaining was intercepted by CB J.C. Wilson. Houston came away with a 26-23 win. The Oilers led in total yards (322 to 274) and first downs (24 to 16) and, most critically, controlled the ball for almost 23 minutes in the second half. Each club turned the ball over four times apiece. Dan Pastorini, who was three-of-nine at the half, completed 15 of 28 passes for 200 yards and a touchdown while giving up one interception. Earl Campbell rushed for 74 yards on 24 carries that included a TD and Rob Carpenter, in addition to gaining 33 yards on 11 rushing attempts, two of them for scores, also caught four passes for 39 yards. Unfortunately, he also suffered a season-ending knee injury. Mike Barber (pictured below) had four pass receptions as well, for 54 yards, and Ken Burrough led the team with 62 yards on his three receptions. For the Patriots, Steve Grogan was successful on 9 of 18 throws for 130 yards with no TDs and two interceptions. He also ran the ball five times for 22 yards and a touchdown. Sam Cunningham rushed for 87 yards on 16 carries and caught three passes for 45 more. Stanley Morgan gained 49 yards on two pass receptions. David Posey had a mixed day, hitting on his first three field goal attempts but then missing two kicks. It was the sixth time that Houston rallied to a win in 1978 and the Oilers went on to finish second in the AFC Central with a 10-6 record, thus qualifying for a Wild Card playoff spot. They reached the AFC Championship game before bowing to the powerful division-rival Pittsburgh Steelers. The Patriots placed first in the AFC East at 11-5, but the departure of Coach Fairbanks just prior to the season finale took the air out of the team and New England lost meekly to the Oilers in the Divisional playoff round. Earl Campbell won the league rushing title with 1450 yards and received MVP honors from the Pro Football Writers and NEA as well as being named Rookie of the Year and a consensus first-team All-NFL selection.